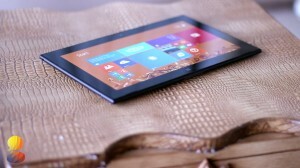 The Lumia 2520 has nice soft curves around its edges and looks a bit like a blown up Lumia phone. It has a soft matte type feel that’s nice and grippy in the hands. The overall construction and build feels really solid. 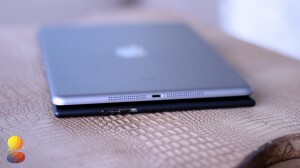 Apple has done a killer job with the design and build of the iPad Air. It’s actually 28% lighter and 20% thinner than the previous gen iPad 4, so it’s definitely deserving of the new name Air. It’s made of a complete unibody aluminum design and it looks and feels ultra premium. That being said, the construction of the iPad Air isn’t perfect. Because it features a complete unibody design, it’s prone to little nicks and scratches that the Lumia 2520 is immune to. 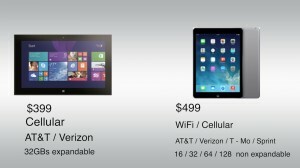 Unfortunately the Lumia 2520 isn’t available in WiFi models, and is exclusively availble on ATT & Verizon. I’m using the ATT model and have been pretty blown away by the LTE speed. The iPad Air on the other hand starts at $499 for the 16GB WiFi model, while pricing can go all the way up to $929 for a cellular variant with 128GBs of internal storage. Unlike the Lumia 2520 which is only offered in 32 GBs and has a micro sd card slot, the iPad can be purchased in 16, 32, 64, and 128 gb models and doesn’t support expandable storage. The display on the iPad Air is great. It’s 9.7-inch and has a pixel density of 264 pixels per inch. The Lumia 2520 features a 1080p 10.1-inch panel at 218 pixels per inch. Both displays are very good, color representation and accuracy was solid, and the overall picture is very crisp. One thing I did notice on the Lumia 2520 was that the display was just a complete fingerprint magnet. The iPad Air runs iOS 7 which is a big step up from iOS 6. iOS 7 offers tons of new features such as control center, new multitasking, and a whole new transparent look. Windows 8.1 gives the Lumia 2520 a lot of flexibility since it’s capable of running applications like Microsoft Word, Powerpoint, and others. Even though it’s great that it supports the native word suite of apps, it still doesn’t have all of the games on other more popular platforms like iOS and Android. Like Samsung, Windows 8.1 uses shared windows which is very convenient for multi tasking on the larger ten inch screen. It’s a feature I use quite often. The Lumia 2520 features a Qualcomm Snapdragon 800 processor clocked at 2.2GHz, 2GB of RAM and Adreno 330 GPU. The iPad Air uses a dual core processor clocked at 1.2GHz and 1GB of RAM. While these might seem light sub par specs, it performed surprisingly well in my testing with graphic intensive games and media. The Lumia 2520 also did very well with games, searching the web, and with general media consumption, but something I noticed was that the heavier weight made it a bit less appealing to carry around. Moving onto battery life, I can quickly say that this isn’t be an issue. Even with battery life on full brightness I made it through several days of usage with plenty of on screen time. The iPad Air is a great device, it features the new iOS 7, superb build quality, and a great display, but the price may be too high. The Lumia 2520 offers a solid suite of native apps, ultra powerful internals, but a lack of third party apps holds it back. Which tablet is best for you? Well that choice has to be made for yourself.